Entomopathogenic nematodes (EPNs) of the families Heterorhabditidae and Steinernematidae are being used as biocontrol agents against many soil borne insect pests in agriculture. Above-ground applications against the insects are usually unsuccessful due to the lack of humidity. Therefore, EPNs rapidly lose their effectiveness. 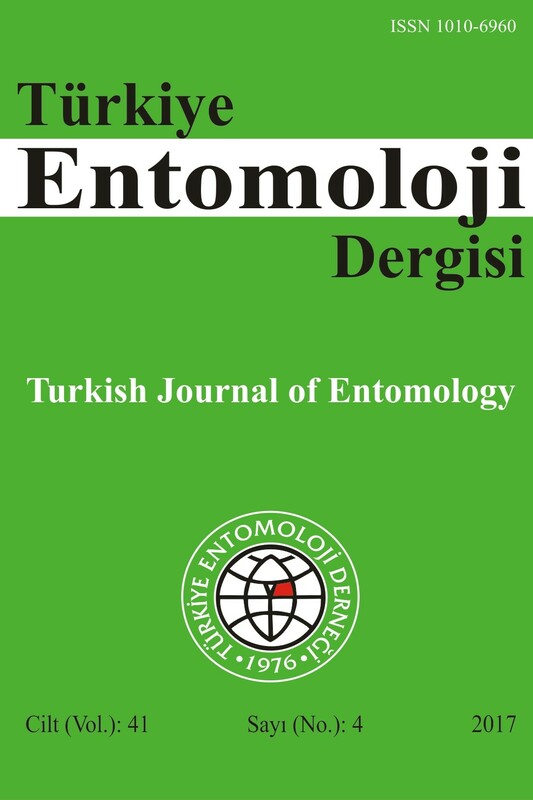 In this study, conducted in 2018 under laboratory conditions in Bursa-Turkey, a new application method was developed for the use of Heterorhabditis bacteriophora(Poinar, 1976) (Rhabditida: Heterorhabditidae) HBH hybrid strain against the migratory locust, Locusta migratoria(Linnaeus, 1758) (Orthoptera: Acrididae). A new trap system is coated with hydrophilic cotton fabric to provide the necessary humidity to allow the use of EPNs above-ground. Three different application rates of H. bacteriophora(5000, 25000 and 50000 IJs) were applied to the trap system. The fabric was inoculated with the nematodes and combined with a reservoir containing 200 ml of ringer solution. The dead and live nematodeswere recorded periodically to determine their persistence on the fabric. The mortality of L. migratoria were also recorded to determine the infectivity of H. bacteriophora. The infectivity and persistence of the nematodes was sustained for more than 4 weeks by this method. Entomopatojen nematodlar (EPN) Heterorhabditidae ve Steinernematidae familyalarına bağlı olan, toprak altında yaşayan zararlı böceklere karşı kullanılan biyolojik mücadele etmenleridir. Toprak üzerine yapılan uygulamalar nemli ortam sağlanamaması nedeniyle başarısız olmaktadır. Bu nedenle toprak üzerinde EPN etkinliği çok kısa sürede yok olmaktadır. Bursa’da laboratuvar koşullarında 2018 yılında yapılan bu çalışmada, Heterorhabditis bacteriophora(Poinar, 1976) (Rhabditida: Heterorhabditidae) HBH hibrit ırkının uygulaması üzerine yeni bir teknik geliştirilmiş ve Locusta migratoria(Linnaeus, 1758) (Orthoptera: Acrididae) üzerindeki etkinliği incelenmiştir. Yeni geliştirilen tuzak sistemi hidrofil bir kumaş ile kaplanmış ve bu kumaş sayesinde tuzak yüzeyinin sürekli olarak nemli kalması sağlanmıştır. Tuzak sisteminde H. bacteriophora’nın üç farklı uygulama dozu (5000, 25000 ve 50000 IJs) kullanılmıştır. Tuzak yüzeyindeki hidrofil kumaş üzerinde belirli dozlardaki nematod solüsyonları uygulanmış ve tuzak sistemi 200 ml Ringer solüsyonu içeren rezervuar ile birleştirilerek kullanıma hazır hale getirilmiştir. Belirli aralıklarla ölü ve canlı EPN bireyleri sayılarak kumaş üzerindeki kalıcılık hesaplanmıştır. Buna ek olarak çekirgelerin ölüm oranları da periyodik olarak hesaplanmış ve tuzağın etkinliği belirlenmiştir. Çalışma sonucunda bu tuzak sistemi sayesinde bu nematodun kalıcılığının artırıldığı ve toprak üzerine yapılan uygulama ile etkinlikte başarı sağlandığı tespit edilmiştir. Arthurs, S., K. M. Heinz & J. R. Prasifka, 2004. An analysis of using entomopathogenic nematodes against above-ground pests. Bulletin of Entomological Research, 94 (4): 297-306. Barbercheck, M. E., 1992. Effect of soil physical factors on biological control agents of soil insect pests. Florida Entomological, 75: 539-548. Baur, M. E., H. K. Kaya, R. Gaugler & B. Tabashnik, 1997. Effects of adjuvants on entomopathogenic nematode persistence and efficacy against Plutella xylostella. Biocontrol Science and Technology, 7: 513-525. Beck, B., E. Brusselman, D. Nuyttens, M. Moens, S. Pollet, F. Temmerman & P. Spanoghe, 2013. Improving foliar applications of entomopathogenic nematodes by selecting adjuvants and spray nozzles. Biocontrol Science and Technology, 23: 507-520. Beck, B., P. Spanoghe, M. Moens, S. Pollet, F. Temmerman & D. Nuyttens, 2015. Foliar-applied entomopathogenic nematodes Steinernema feltiae are not suitable for controlling Thrips tabaci in leek. Bulletin of Insectology, 68 (2): 287-298. Cross, J. V., M. G. Solomon, D. Chandler, P. Jarrett, P. N. Richardson, D. Winstanley, H. Bathon, J. Huber, B. Keller, G. A. Langenbruch & G. Zimmerman, 1999. Biocontrol of pests of apples and pears in Northern and Central Europe: 1. Microbial agents and nematodes. Biocontrol Science and Technology, 9: 125-149. Dito, D. F., D. I. Shapiro-Ilan, C. A. Dunlap, R. W. Behle & E. E. Lewis, 2016. Enhanced biological control potential of the entomopathogenic nematode, Steinernema carpocapsae, applied with a protective gel formulation. Biocontrol Science and Technology, 26 (6): 835-848. Ehlers, R. U., 1996. Current and future use of nematodes in biocontrol: practice and commercial aspects with regard to regulatory policy issues. Biocontrol Science and Technology, 6 (3): 303-316. Gaugler, R., 2002. Entomopathogenic Nematology. CABI Publishing, Wallingford, UK, 394 pp. Georgis, R., A. M. Koppenhöfer, L. A. Lacey, G. Bélair, L. W. Duncan, P. S. Grewal, M. Samish, L. Tan, P. Torr & R. W. H. M. Van Tol, 2006. Successes and failures in the use of parasitic nematodes for pest control. Biological Control, 38 (1): 103-123. Glazer, I., 2002. “Survival Biology, 169-187”. In: Entomopathogenic Nematology (Ed. R. Gaugler). CABI Publishing, Oxon, UK, 394 pp. Grewal, P. S., 2002. “Formulation and Application Technology, 265-287”. In: Entomopathogenic Nematology (Ed. R. Gaugler). CABI Publishing, Oxon, UK, 394 pp. Grewal, P. S., E. E. Lewis, R. Gaugler & J. F. Campbell, 1994. Host finding behavior as a predictor of foraging strategy in entomopathogenic nematodes. Parasitology, 108 (2): 207-215. Kaya, H. K., 1990. “Soil Ecology, 93-111”. In: Entomopathogenic Nematodes in Biological Control (Eds. R. Gaugler & H. K. Kaya). CRC Press, Boca Raton, FL, USA, 381 pp. Kaya, H. K. & S. P. Stock, 1997. “Techniques in Insect Nematology, 281-324”. In: Manual of Techniques in Insect Pathology (Ed. L. A. Lacey). Academic Press, San Diego, CA, USA, 409 pp. Koppenhöfer, A. M. & E. M. Fuzy, 2006. Effect of soil type on infectivity and persistence of the entomopathogenic nematodes Steinernema scarabaei, Steinernema glaseri, Heterorhabditis zealandica, and Heterorhabditis bacteriophora. Journal of Invertebrate Pathology, 92 (1): 11-22. Lacey, L. A. & R. Georgis, 2012. Entomopathogenic nematodes for control of insect pests above and below ground with comments on commercial production. Journal of Nematology, 44 (2): 218-225. Lacey, L. A. & D. I. Shapiro-Ilan, 2008. Microbial control of insect pests in temperate orchard systems: Potential for incorporation into IPM. Annual Review of Entomology, 53: 121-144. Laznik, Ž., D. Znidarcic & S. Trdan, 2011. Control of Trialeurodes vaporariorum (Westwood) adults on glasshouse-grown cucumbers in four different growth substrates: an efficacy comparison of foliar application of Steinernema feltiae (Filipjev) and spraying with thiamethoxam. Turkish Journal of Agriculture and Forestry, 35 (6): 631-640. Lewis, E.E. & D.J. Clarke, 2012. “Nematode parasites and entomopathogens, 395-424”. In: Insect Pathology (Ed. F. E. Vega & H. K. Kaya). Academic Press, Amsterdam, The Netherlands, 508 pp. Ma, J., X. Han, Hasibagan, C. Wang, Y. Zhang, J. Tang, Z. Xie & T. Deveson, 2005. Monitoring East Asian migratory locust plagues using remote sensing data and field investigations. International Journal of Remote Sensing, 26 (3): 629-634. Rai, M. M. & P. H. Chavhan, 2015. Effect of weed plant extracts on migratory locust, Locusta migratoria (R & F). International Journal of Pharmacology and Biological Sciences, 9 (1): 27-32. Rai, M. M., D. G. Gore, M. K. Rathod & A. M. Khurad, 2013. Evidence of transovarial transmission of Bacillus subtilis in the silkworm, Bombyx mori L. Journal of Pharmacy Research, 7 (4): 318-323. Salame, L. & I. Glazer, 2015. Stress avoidance: vertical movement of entomopathogenic nematodes in response to soil moisture gradient. Phytoparasitica, 43: 647-655. Schroer, S. & R. U. Ehlers, 2005. Foliar application of the entomopathogenic nematode Steinernema carpocapsae for biological control of diamondback moth larvae (Plutella xylostella). BioControl, 33: 81-86. Shapiro-Ilan, D. I., R. Han & X. Qiu, 2014. “Production of Entomopathogenic Nematodes, 321-356”. In: Mass Production of Beneficial Organisms: Invertebrates and Entomopathogens (Eds. J. A. Morales-Ramos, M. G. Rojas, D. I. Shapiro-Ilan). Academic Press/Elsevier, Waltham, MA, USA, 742 pp. Showler, A. T., 1995. “Desert Locust Control, Public Health, and Environmental Sustainability in North Africa, 217-239”. In: The North African Environment at Risk (Eds. W. D. Swearingen & A. Bencherifa), West view Press, Boulder, CO., USA., 415 pp. Trdan, S., D. Žnidaračič & M. Vidrih, 2007. Control of Frankliniella occidentalis on greenhouse-grown cucumbers: an efficacy comparison of foliar application of Steinernema feltiae and spraying with abamectin. Russian Journal of Nematology, 15 (1): 25-34. Vos, J. G., E. Dybing, H. A. Greim, O. Ladefoged, C. Lambre, J. V. Tarazona, I. Brandt & A. D. Vethaak, 2000. Health effects of endocrine-disrupting chemicals on wildlife, with special reference to the European situation. Critical Reviews in Toxicology, 30 (1): 71-133. Wang, Y., Q. Huang, X. Zhang & B. Ren, 2014. Application of insect songs in monitoring population density level of Locusta migratoria migratoria (Orthoptera: Acrididae). Zoological Studies, 53 (1):55 (1-7). White, G. F., 1927. A Method for obtaining infective nematode larvae from culture. Science, 66: 302-303. Wright, D., A. Peters, S. Schroer & J. Fife, 2005. “Application Technology, 91-106”. In: Nematodes as Biocontrol Agents (Eds. P. S. Grewal, R. U. Ehlers & D. I. Shapiro-Ilan). CABI Publishing, Wallingford, UK, 528 pp. Zhang, D. X., L. N. Yan, Y. J. Ji, G. M. Hewitt & Z. S. Huang, 2009. Unexpected relationships of substructured populations in Chinese Locusta migratoria. BMC Evolutionary Biology, 9 (1): 144-155.